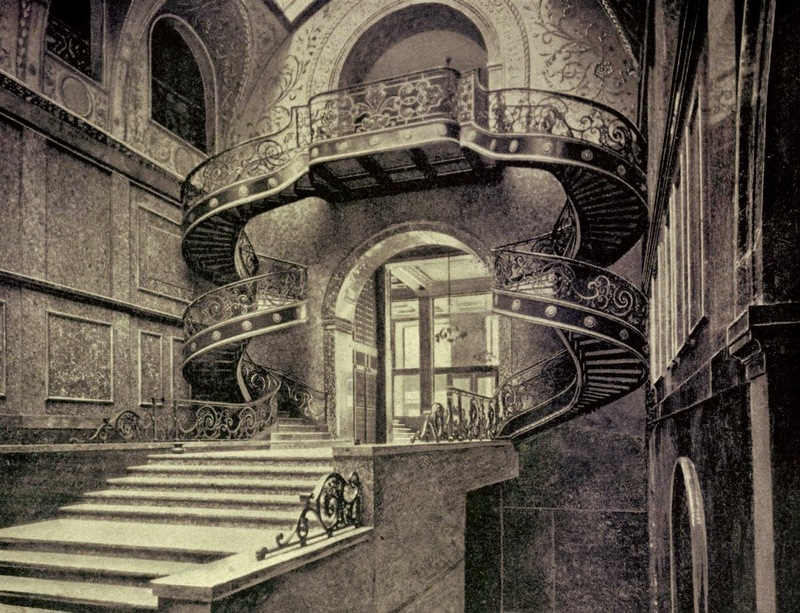 [Image: Stairs inside the New York Life Insurance building, Minneapolis, by Babb, Cook and Willard; view larger]. There are two stairways I wanted to post, as they each solve the problem of getting from one floor to another in a particularly interesting way. The first example, seen above, is from the New York Life Insurance building in Minneapolis, Minnesota, designed by Babb, Cook and Willard. What I love about this is incredibly simple, and it’s nothing more than the fact that a constrained approach from one floor to the next—with the far wall serving almost more like a cliff face—gave the architects no real room to operate. So they put in two, mirror-image spiral stairways, which kept the center of the room clear while dramatically increasing its available circulation space. Today, of course, we’d probably just stick an elevator there and be done with it—but the compression of space made possible by spiral staircases is amazing. They are elegant prosthetics, connecting two levels like a casual afterthought with their efficient knots and coils. (Spotted via the always interesting ARCHI/MAPS).